I’m where few tourists venture: in the far north of Vietnam, way beyond Hanoi. Trudging up a hill I pass a line of trucks, idle as they await loads of commercial cargo. Hammocks hang from the undercarriage beneath a parked truck. With hours to kill, two drivers are sleeping in the shade, their sandals on the curb beside them. Continuing, I walk towards the pass ahead. The air is thin up here; this region is full of rugged mountains. On both sides of this roadway, green mountain ridges reach for the skies. Walking past a guard post I reach a roadside building, where a stray dog shuffles around meekly. Just ahead, a red and white gate post has been lowered down across the road, blocking passage from both directions. A sign next to me says, “Passport Control Exit”. I can go no farther. Beyond that barrier, is the People’s Republic of China. This quiet crossing is ‘Friendship Pass’, near Dong Dang, a border town in the extreme north of Vietnam. Back in 1979 this pass was anything but friendly, when the Red Army of China poured south across this border crossing, in a punitive invasion of their former communist ally. Vietnam and their mammoth northern neighbor had renewed their centuries old rivalry. Unknown to the western public, firefights along this mountainous border had already begun to erupt as early as 1974, before Vietnam’s war in the south had even ended. From then on, confrontations across this border increased. Tensions also grew between the two over Vietnam’s opression of their ethnic Chinese minority. Hundreds of thousands of ethnic Chinese fled Vietnam as refugees. Many that had been forced from their villages in the north, passed through this border as they fled to China. 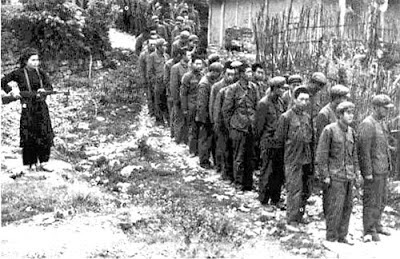 That lesson was to be taught by the Chinese Army, which sent 200,000 troops into Vietnam. They pushed southward all across the rugged border. This pass was the most strategic invasion point, since Hanoi is less than 100 miles away down the highway. When this border war began, some westerners could hardly contain their glee. Two major communist armies were at war, and they weren’t fighting the west, they were fighting each other! The Vietnamese Army had taken weapons given to them by China, and turned them back on the Chinese. Although both countries were communist, the rocky relationship between China and Vietnam has its roots from back before communism existed. In centuries past, China occupied and dominated Vietnam for nearly 1,000 years, until the Vietnamese finally forced them out to regain their independence in the 10th century. The two countries have never liked each other since. really a relationship of convenience. After the US withdrew and Vietnam became friendly with the USSR, Sino-Viet relations quickly soured. Before long the old adversaries were fighting again. Initially having the edge in their invasion, the Chinese advanced south and laid siege to Lang Son, the provincial capital I passed through on my way here. After taking that city on the 17th day of the campaign, the Chinese surprisingly announced their mission 'completed', and that they were returning to China. 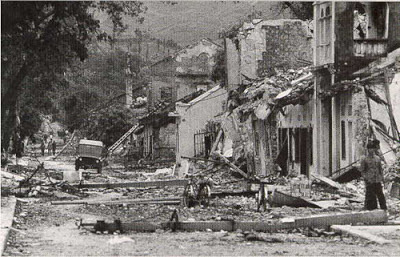 As they retreated, they destroyed almost everything of use on Vietnamese territory. All bridges were blown, and village after village went up in flames. 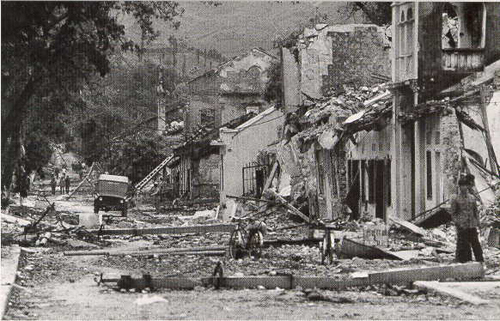 In nearby Dong Dang, just about every building in town was destroyed. 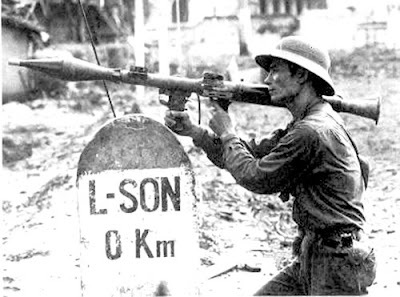 Although material losses in Vietnam were high, the Chinese Army still got the worst of the fighting. China had underestimated the Vietnamese military; already experienced and battle hardened from fighting the US for years. The invading Chinese soldiers on the other hand, had little combat experience. Their last major invasion had been in 1950's Korea. When the last Chinese tank retreated north across the border, the month long war was over. Both sides claimed victory. As both countries guarded their casualty numbers, a reliable count of those killed was never made public. Estimates ranged from 30,000 dead, to as high as 90,000. Most analysts believe that the casualties of the Chinese Army were far higher than the Vietnamese. Whatever ‘lesson’ the Chinese wanted to teach the Vietnamese, it remained unlearned. Vietnam didn’t withdraw from Cambodia, and remained there for another decade. Vietnam’s oppression of their ethnic Chinese minority also continued, and 300,000 of them still live as refugees in China today. They are unlikely to return. As for this contested border, the fighting didn’t stop after Red Army troops crossed into China. Occasional firefights and artillery duels between the two angry neighbors continued across this border well into the 1980’s. Finally, as Vietnam withdrew its troops from Cambodia in the waning days of the cold war, the frontier finally quieted. Peace has been good to both countries, but China continues to be Vietnam's greatest fear. On my way here from Hanoi, our bus passed a couple Vietnamese army bases. I spotted two sets of anti-aircraft guns visible, and both were pointed north, towards China. The simmering antagonism towards the Chinese continues. I once had a taxi driver in Hanoi, who told me that he liked Americans, but hated the Chinese. He said it would be good for the Vietnamese and the US to join up, and together win a war against China. Now there’s a scary thought. Fortunately, these two old communist countries found capitalism more profitable than conflict, and relations are far improved. Friendship Pass is now the busiest border crossing between the two former foes, and trade between the two is booming, increasing year after year. There are even trains crossing Friendship Pass. Twice a week, a train boards in Hanoi and after clearing customs at this border, it continues all the way to Beijing. A major thorn in their bilateral relations has also been removed; defining where the border actually is. After 10 years of work, and with help from the Global Positioning System, demarcation of the border was finally completed in 2009. The Sino -Viet border is finally defined and accepted by both sides. This border has long been quiet, but Beijing and Hanoi still find land to argue over. Political rhetoric continues over possession of the Spratly and Paracel Islands, where Vietnam and China last fought each other out at sea in 1988. If there is ever another war in Vietnam, it will probably be with their powerful northern neighbor in a fight over undersea resources. Today relations continue on a positive trend, and business ties between Vietnam and China have never been stronger. Perhaps the profits of peace will keep this border from ever heating up again. The Vietnamese have endured so many wars, over so many years. Hopefully they have embarked on something that they haven’t had in centuries: a long era of peace.